This figure first appeared on the Return Of The Jedi 65 back card. The card image was slightly retouched for the Tri-Logo version, adding more green to the character?s uniform. Comments: Strange how Kenner considered it integral that the Star Wars line had two different Bespin Security Guards for better army building, yet somehow figured that having only one Rebel Commando was acceptable for the Trilogy?s final ground battle. Whatever the toy maker?s reasons were, at least our good Commando had his trusted pal Prune Face and no less than eight Ewoks to help a pitiful little band defeat an entire legion of the Emperor?s best troops. 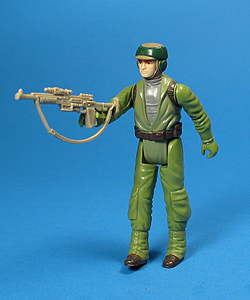 Major Variations: Though all vintage figures have minor variations, the Rebel Commando figure was produced with heads moulded in flesh-toned plastic with a painted helmet as well as heads moulded in light brown (the main helmet colour) with the face painted on. Since this was one of the many figures produced with the removable style head that Kenner favoured using in most post Star Wars figures, it is absolutely impossible to say that either version of the head was produced exclusively in one country, thought it is commonly seen on the figure produced in China. Though quantities may vary from one region to the next, it is popular belief that the flesh-tone moulded head is the scarcer of the two. The Commando Rifle was produced in two different colours. 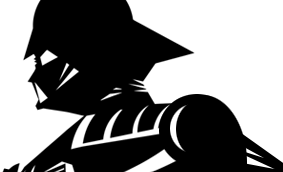 The first, believed to be the more common of the two is a light tan, while the other is a light green. It is impossible to say that either colour was produced exclusively for one specific version of the figure.